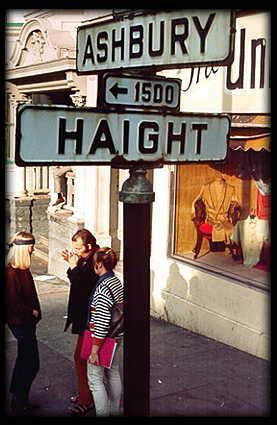 A district of San Francisco marked by the intersection of Haight and Ashbury streets; it is commonly called The Haight. It generally encompasses the neighborhood surrounding Haight Street, Stanyan Street, Golden Gate Park, and Buena Vista Park. The neighborhood has many divisions within it such as Upper Haight and the Lower Haight districts. Haight-Ashbury is most famous for its role in the hippie counterculture and beat movement to which it became home to the Summer of Love in 1967. The Summer of Love marked a highlight of the 1960s counterculture and created bohemian presence within Haight-Ashbury that still exists today. Before the completion of the Haight Street Cable Railroad in 1883, what is now known as Haight-Ashbury was a collection of isolated farms and acres of sand dunes. The cable car connected the west end of Golden Gate Park with the central Market Street line and the rest of downtown San Francisco. The building techniques of the 1890s reinvented Haight-Ashbury as an upper middle class district and one of the only neighborhoods spared by the San Francisco earthquake of 1906. After the Depression, residents began leaving the declining neighborhood and the exodus of many middle class residents left many units for rent. The cheap housing which was elaborately detailed became home to many hippies during the 1960s, due to the abundance of properties for rent. This gave birth to a bohemian presence in Haight-Ashbury which is still present to this day. San Francisco and the Haight became the center of illegal drug culture and rock lifestyles by the mid 60s with the abundant use of marijuana and LSD. The Haight became famous for having a number of important psychedelic rock performers living in the area such as Jefferson Airplane, Grateful Dead, and Janis Joplin. The rock culture of Haight-Ashbury immortalized the scene in song, but exemplified the hippie counterculture perfectly; living, making music, and doing drugs as a family. By the Summer of Love, psychedelic rock music broke into the mainstream with the song “San Francisco” by the mamas & the Papas and the Monterey Pop Festival. Psychedelic Haight bands such as Big Brother and the Holding Company and Jefferson Airplane were catapulted into national stardom. A Time magazine cover story on the hippie subculture and a CBS News television report on “The Hippie Temptation” popularized the movement further and spread it across the world. Thousands of youth migrated to the Haight including runaway teenagers altering the social structure of the Haight as well as the views of San Francisco as a city. As the population of Haight grew, a medical crisis surfaced due to drug use and lack of insurance leading Dr. David E. Smith to open the Haight Ashbury Free Clinic on June 7, 1967 which was the first free clinic in the U.S. without religious affiliation. To this day, the bohemian influence can be seen within the Haight. Ben & Jerry’s Ice Cream is located at the Haight-Ashbury intersection and the neighborhood remains a thriving center of independent local business. It is home to a number of independent restaurants, bars, clothing boutiques, booksellers, head shops, and record stores including the well-known Amoeba Music. It is also home to the Haight-Ashbury Street Fair which is held on the second Sunday of June to celebrate the Summer of Love. Just as it had in the 1960s, the diversity and bohemian nature of Haight-Ashbury remains a symbol of freedom and its attraction as a unique and culturally rich city.